A new law that expands police powers to allow officers to respond swiftly and with greater flexibility during serious incidents like a terrorist attack was passed yesterday after a three-hour debate. Under the Public Order and Safety (Special Powers) Act (POSSPA), the police commissioner can impose measures such as a curfew and a stop order on communications to ensure the secrecy of security operations. But the Act may be invoked only with the authorisation of the Home Affairs Minister, Second Minister for Home Affairs Josephine Teo said yesterday, following concerns expressed by MPs during the debate on the proposed legislation. Other safeguards are also in place to ensure the police commissioner and the minister exercise their special powers only for specified incidents, where the police are likely to be in a race against time, Mrs Teo added. "Once the threshold of a serious incident is crossed, we must give the police sufficient latitude to act decisively," she told the House on the final day of a three-day sitting. The new law comes in the wake of a "clear and continuing threat" of a terror attack facing Singapore, which has been cited as a target in extremist publications and videos. During the debate, Nominated MP Kok Heng Leun, who was among 10 members of the House who spoke on the proposed legislation, expressed concern over the discretion given to the minister and police commissioner. Mr Kok asked if there could be conditions on the use of the special powers, and cited the Internal Security Act, which requires the minister's decision to be concurred by the president on the advice of a special advisory committee. Replying, Mrs Teo stressed that the special powers will not be used for day-to-day policing, but only for specified incidents like a terrorist act or large-scale public disorder. "Members will have to weigh: Which is the bigger risk in a serious incident? Which has the graver consequence?" she said. "There is a risk of too much discretion, but there is also a risk of too much delay." Mrs Teo also said that after an incident has been dealt with, Parliament can still debate if the minister and police had done the right thing and hold them to account - as was with the 2013 Little India riot. This new law repeals the Public Order (Preservation) Act, which allowed Parliament to annul the minister's proclamation as a safeguard. This will no longer be the case. "There is no sinister reason for this," said Mrs Teo. " Judicial review of the minister's decision to make an activation order remains an avenue to curb improper use... of his powers." She noted that the old Act was used only once since independence, and it was after the Little India riot. "Even then, it was tightly scoped, to control the consumption of alcohol, to calm the situation and prevent further violence," she said. Another concern raised is what constitutes reasonable force, during which lethal weapons can be used. Mrs Teo said lethal weapons are used only if the police have no other choice, and cited the Shangri-La Dialogue incident in 2015, in which a car sped through a police checkpoint. Police had to use "reasonable force", including lethal weapons, as it was a high-profile event involving foreign dignitaries, and there was a risk the driver was committing a terror act. Almost all the MPs sought clarification on the communications stop order, which can make it an offence to take photos or videos of an incident area when the order is activated. Mrs Teo said: "Police will exercise discretion and take into consideration the circumstances under which the recorder was in and if the breach could not have been reasonably avoided." The new powers under the Public Order and Safety (Special Powers) Act allow the police to deal with serious incidents like terror attacks, and are not meant for day-to-day policing work. Failure to comply can mean fines of up to $20,000 and two years in jail. The police may issue a communications stop order to prevent critical information about law enforcement operations from falling into the wrong hands. The order means people are required to stop filming or spreading videos and pictures of an incident area, and to stop sending text or audio messages about security operations happening there. A police officer may also direct people to destroy a film, picture or message immediately, or to surrender the device it was recorded on. The order is not aimed at civilians who are caught in a hostage situation and trying to get information out to the police and loved ones. Without having to identify the remote pilot, the police can take down or disable any unmanned aircraft and autonomous vehicles in and around an incident area - regardless of their intention or activity. Telco services, such as cell coverage and telephone lines, can be withdrawn from a specified area to restrict communication. As this power can impact the public significantly, only the Home Affairs Minister can issue this direction, which can be used when the communications stop order is insufficient or ineffective. Police can direct owners of buildings to help manage public safety. These actions include closing their premises, restricting entry or exit, and providing information such as floor plans. Police officers may direct other law enforcement officers, soldiers and civilians to assist them. However, civilians are not obliged to do so. Police will rely on those who are able and willing to assist in duties such as manning a cordon or redirecting traffic. These civilian assistants are not allowed to use lethal force. Police officers can stop any individual in the incident area for as long as necessary to question him, in order to ascertain the person's identity and to get information which can aid the police's operations. Peaceful protests are not the target of a new law to deal with serious incidents like a terror attack, Second Minister for Home Affairs Josephine Teo said yesterday. The issue had emerged as a sticking point during the debate on the Public Order and Safety (Special Powers) Bill in Parliament, with MPs zeroing in on an example of a sit-down demonstration in the legislation. The example was one of a few used to illustrate what constitutes a "serious incident", which would lead to the invoking of the law and possible use of lethal weapons to disperse an assembly or procession. Specifically, it illustrates an act that could cause large-scale public disorder. Some MPs such as Mr Louis Ng (Nee Soon GRC) and Mr Ang Wei Neng (Jurong GRC) had asked why acts causing large-scale public disorder are considered serious incidents on the same scale as violent acts of terrorism. To this, Mrs Teo said "not every protest will meet the high threshold to be considered a serious incident". The illustration in the Act is of a protracted sit-down demonstration that lasts over a week. It also involves a large and growing group occupying public spaces in the Central Business District, and interfering with daily activities such as the flow of traffic. Mrs Teo said such significant disruption to the lives of ordinary Singaporeans could lead to agitation and cause tensions to rise, and "if it is not diffused, things could quickly turn chaotic". But she added that the law will be invoked only if the situation deteriorates and the threat of large-scale public disorder or violence becomes imminent. Contrary to assertions of some civil society groups, said Mrs Teo, the law will not be applied to peaceful demonstrations that do not cross this threshold. She warned, though, that peaceful demonstrations can quickly spiral into violence and threaten public safety. The London Riots in 2011, for example, started as a peaceful demonstration against a court ruling but degenerated into rioting, looting, and setting buildings and vehicles on fire, leading to death and injuries, she said. "The point is this: Peaceful intent does not guarantee peaceful outcomes," she added. Workers' Party chairman Sylvia Lim (Aljunied GRC) asked if such incidents can be dealt with under existing legislation, such as the Penal Code, instead. But Mrs Teo said some powers of the new law are not found in any existing laws. For instance, in the case of a growing demonstration that could get chaotic, the police may need to order nearby premises to close, impose a cordon and direct people to stay out of the area. This is to reduce the risk of property damage, or prevent the crowd from building up further. Powers under the new Act are "necessary to do this", she said. She added: "Where possible, we will indeed use existing laws to deal with such situations." In fact, said Mrs Teo, the police have had the powers to deal with large-scale public disorder under the Public Order (Preservation) Act, which was enacted in 1958 and will be repealed by the new law. But they have only invoked the powers once since independence, in the aftermath of the 2013 Little India riot, to control alcohol consumption, calm the situation and prevent further violence, she added. Even then, this was "tightly scoped", she said. Citing the illegal protests on the Malaysian elections that took place in the Merlion Park in 2013, Mrs Teo said the police had issued 74 conditional warnings under the Public Order Act then, instead of invoking the Public Order (Preservation) Act. "Our record is clear and consistent. We have never used the Public Order (Preservation) Act against political dissent," she added. Studying terror attacks overseas has revealed "gaps" in Singapore's laws to deal with such serious incidents, said Second Minister for Home Affairs Josephine Teo. She cited the manhunt following the 2013 Boston Marathon bombing, where the Boston police issued a voluntary stay-in-place request to residents in Watertown when searching for the suspect. Despite the request, some residents still ventured outdoors and unknowingly affected police operations, she said. Had a similar manhunt taken place in Singapore, police could not have activated special powers to enforce a curfew in the search area as there was no public disorder, Mrs Teo noted. This is why the new Public Order and Safety (Special Powers) Act is needed, she told Parliament yesterday when she presented the Bill for debate. It was later passed. Mrs Teo also said Singapore's laws did not allow police to respond as promptly, citing how the theatre of police operations can shift quickly, like in the aftermath of the attack on French satirical newspaper Charlie Hebdo. This is because with the Public Order (Preservation) Act, the Home Affairs Minister would have to make new proclamations to bring the powers to bear in every new incident area when operations shift to a new location. The new laws will allow the police commissioner to invoke the powers when deemed necessary, after an activation order is given by the minister. Special powers granted to police also include enforcing a communications stop order that penalises the taking of photos and videos of an incident area when the order is in place. Mrs Teo noted that in several overseas incidents, police had appealed to the public not to transmit or broadcast videos of ongoing security operations to protect their officers and members of the public. "But this is usually not effective," she said. She gave the example of how police pursued the two gunmen from the Charlie Hebdo attack across north-eastern France. On the day police stormed their hiding spot, a third gunman had walked into a Jewish supermarket, taking hostages. In that case, live news footage showed police gathering outside the store and getting ready to storm the place, she said. "The terrorist had every possibility of watching every move of the police's operation, as it happened." She added: "These overseas examples show why our laws need updating." 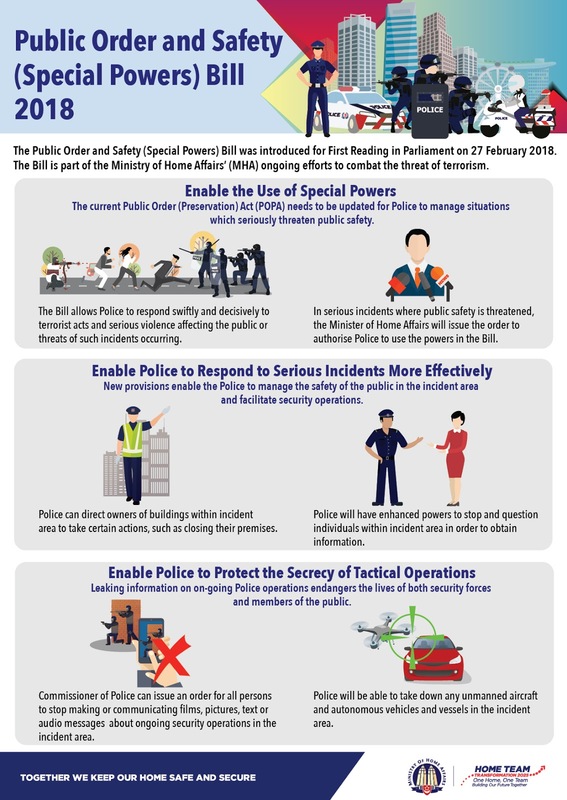 The curbs on communications allowed - under a new law expanding police powers to deal with serious incidents - will not result in an information blackout, Second Minister for Home Affairs Josephine Teo said yesterday. Selected media outlets and personnel will be allowed to access incident areas even when a communications stop order is issued. The order will not be used to gag innocent parties either, she said. "If members of the public are acting in good faith to provide information to the authorities but inadvertently breach the (order), we do not intend to take action," Mrs Teo said. She added that the order does not target civilians caught in a hostage situation trying to reach out to their loved ones. Mrs Teo was responding to MPs, including Mr Melvin Yong (Tanjong Pagar GRC) and Nominated MP K. Thanaletchimi, who had raised concerns. The stop order has garnered much attention since the Bill was introduced last month. If activated, it makes it an offence for people, including the media, to film or take pictures of an incident area or to send messages about security operations. Yesterday, Mr Ang Wei Neng (Jurong GRC) noted that preventing the media from doing its job could lead to "a gap in the documentation of Singapore's history". Mrs Teo said that the media outlets allowed to access incident areas can record events for subsequent use such as post-incident reporting. She added that the Home Affairs Ministry had earlier spoken to local media to discuss how it can report the news despite a stop order. She noted that the media had raised similar concerns to MPs and the public. Pointing to incidents overseas in which terrorists holding hostages could find out about police operations through live telecasts, she said: "We are trying to stop irresponsible communication of ongoing security operations which may endanger lives." On the argument that people should be allowed to film the scene as long as it was not transmitted, she cautioned that "half measures will not cut it". She added that stop orders may be able to only reduce - but not eradicate - the risk of unauthorised communications. Mrs Teo also said the order will apply only to target areas and is limited in duration. It will be lifted after security operations are over. Like other special powers in the Bill, it may last a maximum period of a month. A breach of the order may lead to a maximum of two years in jail, a fine of up to $20,000, or both. Yesterday, Ms Sylvia Lim (Aljunied GRC) highlighted that footage or photographs taken at the scene of major incidents have enabled the truth to emerge. In a London Group of 20 summit in 2009, for instance, a man fell and died in the vicinity of a police operation mounted to manage protesters. Police denied they had an altercation with him until a video proved otherwise, she said, adding that "in any investigation, evidence talks". Mrs Teo replied that police investigations do not start and end with photo or video evidence, and it is unlikely a stop order would have been issued for a case like the G-20 summit. Asked by NMP Kok Heng Leun if the stop order would allow police to delete videos showing abuse of powers, Mrs Teo said it would be a criminal offence to dispose of evidence. Mr Kok also noted that the aim of terrorism is not just fatalities, but the causing of fear and distrust, destabilising society. "In the aftermath of such an event, it is important that there is enough information for us to piece things together, to verify facts, to dismiss accusations and restore justice if need be... (Such information) can help a lot in the healing of the community," he said. A law enacted in 1958 to provide special powers to deal with large-scale communal riots has never been used against public assemblies and there is no intention to use an updated version of the law to regulate peaceful public assemblies. The Ministry of Home Affairs (MHA) said yesterday that the Public Order and Safety (Special Powers) Bill is "not meant for day-to-day policing". The difference between the existing Act and the Bill is "new provisions which would allow us to better deal with today's prevailing terror threat", it added. This was in response to concerns raised in a joint statement on Wednesday by several local civil society groups, claiming that provisions in the Bill could lead to an abuse of power by the police and oppression against peaceful protesters. In the Bill, which was tabled in Parliament on Feb 27, serious incidents are described as terrorist acts, serious violence affecting the public, and acts causing large-scale public disorder. In their statement, the groups called on the Government to narrow the definition of "serious incident", arguing that peaceful protests should not be treated in the same way as terrorist violence, describing such protests as non-violent and not threatening public safety. But the MHA said it is disingenuous to assert that large-scale assemblies are devoid of violence and injuries. "In the 2011 London riots, at least 202 people, including police officers, were injured, and five people died, after what started off as a peaceful assembly," said the ministry. The civil society groups said that with existing strict laws against assembly, the police are already empowered to respond to peaceful protests "as they would any prohibited activity, and have done so", and that special powers are not needed. The MHA said the threshold for special powers to be activated in the Bill is high and can be used by the police only after the Minister for Home Affairs has issued an activation order. This can be done only after the minister is satisfied that a serious incident has occurred or is occurring in Singapore. The order, which can also be issued when there is a threat of such a serious incident occurring, gives special powers to the police to prevent the incident, reduce its impact, or control, restore or maintain public order. "Such assessments are not made lightly," said the MHA. The proposed law would give the Commissioner of Police power to issue a communications stop order (CSO) while security operations are ongoing during a serious incident. People will then have to stop filming or taking pictures of the incident area, or from sending what they have taken on to others. The civil society groups took issue with this, saying it was puzzling as it "gives rise to fears of undocumented abuse of police powers". Should there be disputes later about police actions, "the police would benefit from independent documentation", the groups said in their statement. The MHA reiterated that the CSO serves to prevent security operations from being compromised and to protect the safety of officers and members of the public involved or caught up in the operations. The ministry said that those who encounter any cases of misconduct or abuse of powers by police officers can lodge a police report or complain directly to the ministry. "We have always taken a serious view of all feedback about police officers and will investigate thoroughly," said the MHA. The right balance between free speech and national security or public order considerations came under scrutiny as Parliament passed two new laws yesterday. The first, the Public Order and Safety (Special Powers) Bill, addresses the heightened security threat - especially from terrorism - and gives law enforcement agencies special powers to deal with exceptional situations. With its passage, the new legislation updates and replaces an earlier law that was designed primarily to tackle communal riots. Under the law, the authorities can activate certain powers, such as the power to stop the making or communication of a film, and text or audio message within an incident area; direct owners to close or restrict entry to their premises; and impose cordons, even in private places. Second Home Affairs Minister Josephine Teo said the law confers a tactical advantage on the police when they respond to terrorist attacks and other situations that may spiral out of control. MPs noted the wide-ranging nature of the law's powers and raised a number of concerns. Would a communications stop order bar someone from warning his loved ones to avoid the incident area, or from even reporting to them that he is safe? It theoretically would. But Mrs Teo said police will consider the circumstances when looking into breaches of the order. Workers' Party (WP) chairman Sylvia Lim (Aljunied GRC) and Nominated MP Kok Heng Leun said recording of videos as evidence may be legitimate in cases of alleged police abuse, for instance. Mr Kok asked if the law empowered the police to delete such videos. Mrs Teo said police body cameras would continue to be used, and pointed out that investigations into abuse do not start and end with video evidence, as other forms of evidence are also available. She added that it is a crime for an officer to delete a video containing proof of abuse, as that would constitute disposal of evidence. A second scenario where the right to communicate or express oneself freely could be curtailed is in the case of a protest. The new law allows for special powers to be used to break up a protracted protest, which involves a crowd that is large and growing in number, which results in the occupation of, say, the Central Business District, and "starts to impede the flow of vehicular and pedestrian traffic and interfere with normal trade or business activities in the area". Mr Kok, one of the MPs most vocal in expressing concerns about the Bill, said this scenario should not be classified as a "serious incident", and could be dealt with via existing legislation. Disagreeing, Mrs Teo asked: "Is that the view of most Singaporeans? I do not think so." She said Singaporeans were more likely than not to call on the police to take decisive action, and would be agitated over the disruptions to normal life. If not defused, the situation could also turn chaotic. Police may thus need powers to direct people away from the area. A third discussion where free speech arose was during the debate on changes to the Films Act. The law makes changes to the way films are classified and expands enforcement and investigation powers of regulatory officers. WP Non-Constituency MP Daniel Goh called for a loosening of restrictions on party political films, which come under the Films Act, but which were not included in this round of amendments. Senior Minister of State for Communications and Information Chee Hong Tat said many films with political content are in fact allowed, and the prohibition is targeted specifically at political films that "seek to sensationalise or distort serious issues, to evoke emotional rather than logical debate based on facts". It comes down to "basic judgment" on "whether it is better to debate political issues with words and logic or with images and emotions", he added. But Associate Professor Goh said he would like to be able to watch such films in order to "make the judgment myself". To this, Mr Chee said the Government exercised its power in a "judicious and careful" way. One thread that ran through the discussions was that the answer to when and how much to rein in free speech is never absolute. It can change and has changed over time. Communications stop orders were not deemed necessary until now as the security assessment has shifted. Mrs Teo's reference to Singaporeans not being able to tolerate large protests that can be disruptive for an extended period of time suggests that the situation may be different if people were to become more tolerant of them. As for party political films, changes were made in 2009 to ease restrictions, although films still had to be factual and objective. In explaining the move to loosen the law at that time, then Senior Minister of State Lui Tuck Yew said that "societal norms have evolved". Ultimately, free speech and public order are both valuable. Each generation must exercise pragmatism and common sense in deciding where to strike the balance, given prevailing levels of maturity among the population and the changing social, economic and security context. These are not, strictly, questions of right or wrong, but questions of degree. Law and Home Affairs Minister K. Shanmugam assured police officers yesterday at the annual Singapore Police Force workplan seminar that they can discharge their duties confidently because their leaders in the Ministry of Home Affairs (MHA) and the police force would stand by them. Addressing about 1,000 officers who attended the seminar yesterday, Mr Shanmugam said it is the Government's job to propose legislation, carry it and make necessary assessments. "You just do yours, and you will get the full support," he said, reassuring officers that the MHA and police force would stand by them. In the same vein, if things go wrong operationally, it is the minister who will be accountable and responsible to the public, he said. There has to be internal accountability, he added, and the relevant leaders will need to ensure mistakes are not repeated. "That is my approach... And the (uniformed) services need to know that very clearly. So that you can go about your work confidently, and do your duty, and have faith and trust in the system. That is what is asked of you. Leave the rest to us, and be assured that we will answer the questions and shield you from political attacks." He cited a 2016 ministerial statement he gave in Parliament when concerns were raised about investigation processes when handling young suspects, following the suicide of 14-year-old Benjamin Lim after he was questioned by police over an alleged molestation case. During that period, Mr Shanmugam said police officers should not be attacked and publicly added that he would take responsibility if the issue was with protocols. An MHA review in 2016 concluded that existing processes were sound and suggested adjustments to boost coordination among agencies. The Appropriate Adult Scheme for Young Suspects was introduced in April last year, allowing some youngsters to be accompanied by independent volunteers during police interviews. Mr Shanmugam also said that despite online sentiment that appeared to oppose the passing of the Public Order and Safety (Special Powers) Bill, a recent survey on that particular law showed that the majority supported it. The Bill, which was passed in March, gives the police expanded powers to deal with terror attacks and, among other things, allows officers to enforce a communications stop order. The minister said the survey, conducted by government feedback unit REACH, showed that 82 per cent of the 1,038 people polled supported the Act. "(If) you looked online during the period when we had the legislation in gestation, it would have created the feeling that there was a lot of opposition to it and we were doing something that was terrible." The same REACH survey revealed that 76 per cent indicated that the Act was necessary to enable the police to handle major security incidents effectively. The survey was done after the law was passed. Another 67 per cent thought it was reasonable for police to have powers to stop individuals from taking or sharing messages and videos about ongoing security operations, and 78 per cent said they trusted that the police would exercise these powers fairly. In his speech yesterday, Mr Shanmugam noted that the new legislation, which will replace the Public Order (Preservation) Act, gives police powers that would not be "doable" in many countries. He said: "I believed it was doable in Singapore because people trust the police that they will exercise their powers responsibly, and we need those powers to deal with the situations that are evolving. You cannot deal with the new threats with legislation that is outdated. Which is the problem that many countries are having." He cited the example of the 2011 UK riots which killed five people and injured 205, of which nearly 190 were police officers. Property damage was estimated to be £200 million (S$363 million). "We know our people, they trust our Government, they trust our police. Majority of them, they do not want this sort of nonsense." Instead of getting sidetracked by the 20 per cent who may object to a measure, "you ought to be focusing on the 80 per cent". "So we have to be confident about what we do," Mr Shanmugam added. "As long as we believe honestly that it is the right thing to do. "As for opposing viewpoints, we have a duty to look into them. Some of them, as I said, can be principled, and if the viewpoints are valid, we have to consider, adapt, make the necessary changes, and then when we make up our mind, proceed."